Features: Flip Flops, Buckle Strap, Crisscross Design, with Arch Support, Open Toe. Detail: The Buckle strap could be adjustbale to make the sandals more fit with your foot. 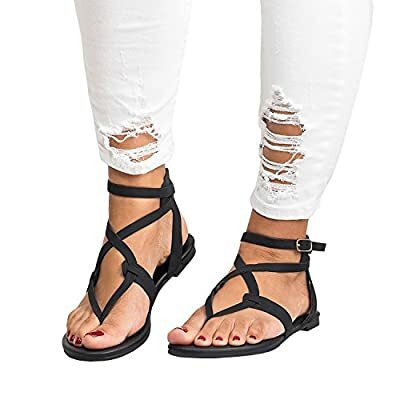 Flat Sandals Gladiator Thong Ankle Buckle Strap Slip On Summer Beach Casual Shoes for women. Suit for spring, summer and autumn wear, beach wear,and Perfect paired with dresses, skirts, pants, and denim. Notice:Focus on buyer satisfaction.If you have any problem,please feel free to contact us.